It has definitely been a long long time since I last wrote a proper review and I must say that I actually missed it. Anyhow, I'm so sorry for not updating my blog but here I am now. 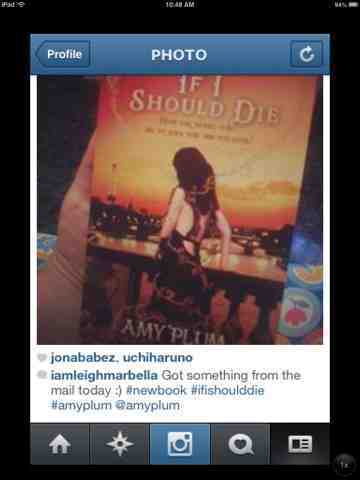 I recently finished reading Amy Plum's If I Should Die and I must say this is one of those books that you wouldn't want to put down. Anyhoo, the novel is told in Kate's POV again. Got this from The Book Depository a few days ago. I was just so excited to get this one since this is one of my favorite series. I had this happy-sad moments when I finished reading it. This is definitely my favorite in the entire series. I think Kate developed into an awesome character as the story progressed. I didn't expect the ending though. I was clutching my chest halfway through the book. I really didn't know what to expect. And Vincent as usual made my heart melt every now and then. I love the fact that Kate's and his love is one of those epic love stories that you wouldn't forget for a very long time. Overall, I really enjoyed reading this. It was definitely very entertaining and unputdownable. I was really excited for this one and had it pre-ordered a couple of months before its release. It had a bittersweet ending though with deaths on both the Numa and Bardia sides. The events in the book were very unexpected for me but all in all it was just awesome in every way. Two thumbs up Amy!